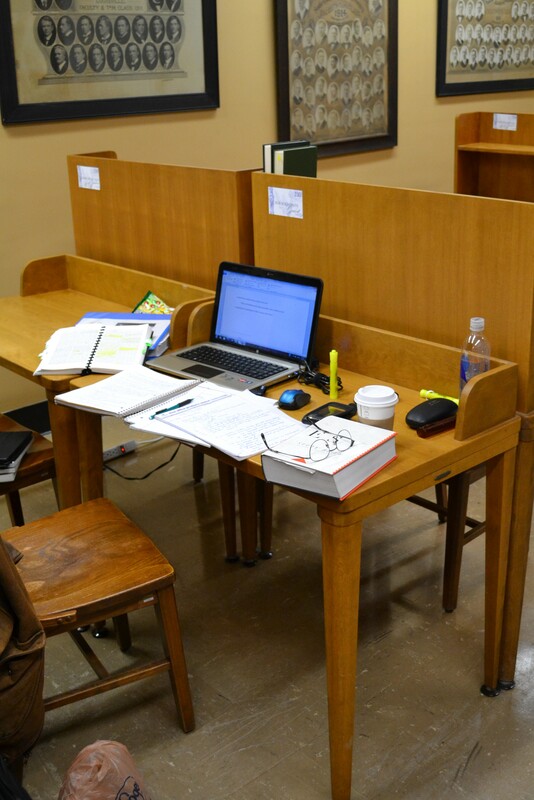 For the next few weeks, this is my “home” for research and writing about Gurnall. Thought you might like to see the cozy little place in the back of the stacks of the SBTS library. It’s quiet. My “close” PhD friends have yet to appear, but I’m sure we’ll all get along just fine. The only odd thing are the pictures of grads from decades ago. I get the feeling they are looking over my shoulder to make sure I carry on the gospel traditions. There are no windows to distract with calls to day-dreaming. But there are plenty of good books all around me! That could be a major distraction. Every now and then, I peak into the cyber world, just for a break. What has struck me about reading Gurnall this time through is his down-to-earth practicality for growth in holiness. The Puritans were preeminently practical in their approach to the Christian life. They believed that the pursuit of holiness was “Job 1” for the believer because without holiness no one will see the Lord (Heb 12:14). They thought that there should be no reason for not “tasting” the holiness of God before meeting him one day. In fact, it was every Christian’s responsibility to become as holy as a redeemed sinner could be! On every page, Gurnall offers more practical advice for pursuing holiness by overcoming temptations and sin through the power of the Spirit and the work of prayer. The key to victory over the world, the flesh and the devil is to “feast” on our union with Christ. Not only does our salvation spring forth from that union, but our sanctification is nurtured in the rich soil of that union. All you Gurnallian Warriors probably knew that before. So let me ask you, those who were in the Gurnallian Warrior project — how goes the fight? Remember that Gurnall said if we are not being filled with the Spirit on a daily basis, we are leaking on a daily basis! Keep up the fight! Love it! I’ll post on the FBC Fb page.